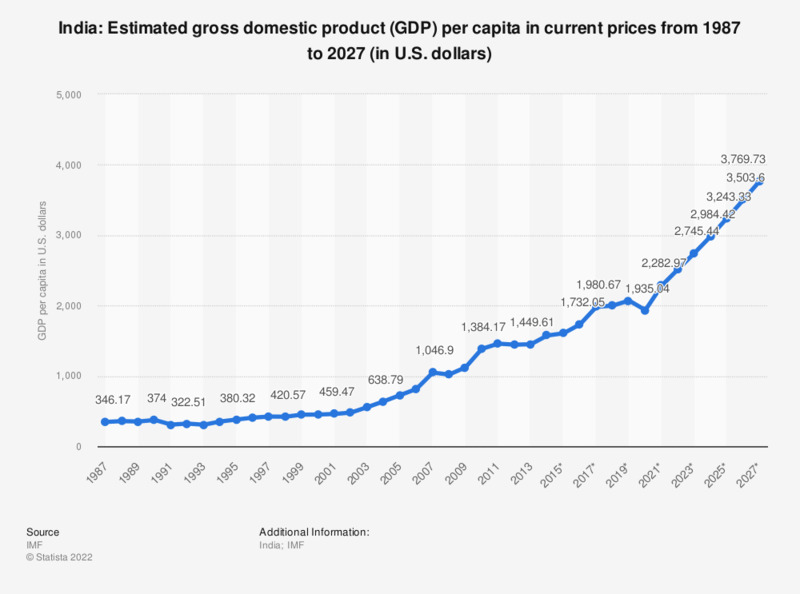 The statistic shows the gross domestic product (GDP) per capita in India from 2012 to 2013, with projections up until 2022. In 2017, the estimated gross domestic product per capita in India amounted to about 1,976.09 U.S. dollars. See figures on India's economic growth here. For comparison, per capita GDP in China had reached about 6,995.25 U.S. dollars in 2013. India’s progress as a country over the past decade can be attributed to a global dependency on cheaper production of goods and services from developed countries around the world. India’s economy is built upon its agriculture, manufacturing and services sector, which, along with its drastic rise in population and demand for employment, led to a significant increase of the nation’s GDP per capita. Despite experiencing rather momentous economic gains since the mid 2000s, the Indian economy stagnated around 2012, with a decrease in general growth as well as the value of its currency. Residents and consumers in India have recently shown pessimism regarding the future of the Indian economy as well as their own financial situation, and with the recent economic standstill, consumer confidence in the country could potentially lower in the near future. Typical Indian exports consist of agricultural products, jewelry, chemicals and ores. Imports consist primarily of crude oil, gold and precious stones, used primarily in the manufacturing of jewelry. As a result, India has seen a rather highly increased demand of several gems in order to boost their jewelry industry and in general their exports. Although India does not export an extensive amount of goods, especially when considering the stature of the country, India has remained as one of the world’s largest exporters.